Mark Cooper, an equipment operator for Rocky Fork State Park, is shown bringing wood into the collection area of the old basketball court, just off the main entrance from North Shore Drive. There’s good news for Highland County residents that heat with wood, since officials at both Rocky Fork and Paint Creek state parks have specific sites designated as firewood collection areas with free firewood for the taking. The free firewood comes from storm damage over the years and the destructive effects of the emerald ash borer and pine shoot beetle, both of which have left a trail of damage to trees at the two state parks. According to a press release, Rocky Fork and Paint Creek state parks are in the quarantine area for both types of the invasive insects, and transporting firewood outside of the confinement area or across states lines is prohibited. Matthew Lewis, a natural resource technician supervisor at Rocky Fork, told The Times-Gazette that a hazard tree assessment was performed by a forester from the Ohio Department of Natural Resources Division of Forestry, who marked trees deemed unsafe that would be cut down, as well as fallen and downed timber, that is free through the end of the month. He said that although no standing timber can be cut and that vehicles cannot be driven off roadways or parking lots, people are welcome to bring their chainsaws and remove any of the dead wood that has been deposited in the parking lot of the old basketball court, located up a small hill off the North Shore Drive entrance to Rocky Fork State Park. There is a permit process required, he said, but once that paper is filled out, the public is welcome to come in, cut, and use the wood for their own personal use. 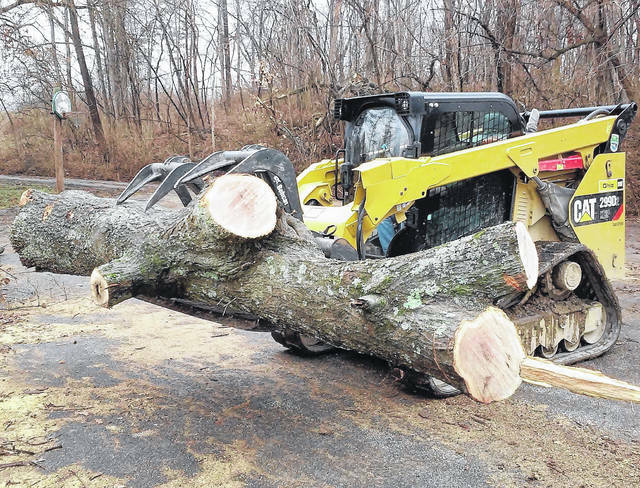 He said there is a four-phase plan in place for maintaining wood safety at both Rocky Fork and Paint Creek, and there will be additional cutting phases throughout the year that involve outlying areas bordering private property. Two of the four-phases have already been accomplished, according to Lewis. He said the initial phases just completed will be re-assessed with additional maintenance work, and that the wood from that should be available in early 2021. The old basketball court area of Rocky Fork Lake is open to firewood collection everyday through Feb. 28 from 8 a.m. to 5 p.m. The same regulations apply for those going to Paint Creek State Park, which will have free firewood available for public cutting in the campground area during daylight hours through March 31, 2019.